The rebirth of scleral contact lenses is certainly the most relevant contact phenomenon in recent years. A large number of publications, scientific works and reports in congresses, are dedicated all over the world to this type of contact lens that only a few years ago was the professional heritage of only a few enthusiastic specialists. Now, the number of supporters has grown exponentially worldwide. 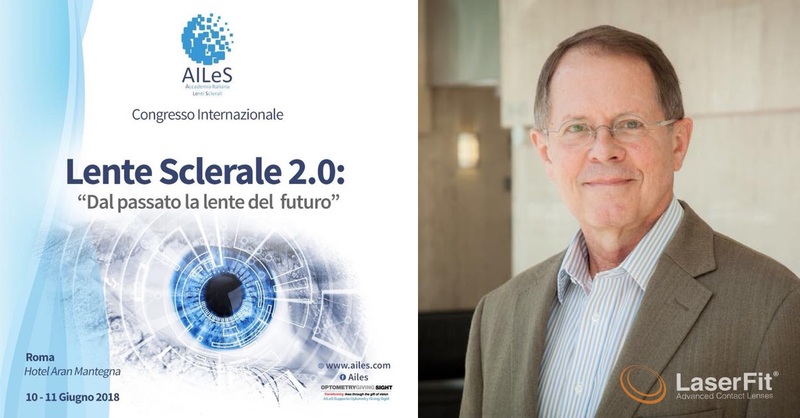 Seven professionals in Italy, and “passionate lovers” of the topic, eager to discuss the aspects related to these interesting contact lenses, have come together and founded the AILeS: the Italian Academy of Scleral Lenses. AILeS is a non-profit organization that has scientific and cultural goals and its mission is therefore to promote the dissemination of clinical and scientific culture related to scleral lenses, both towards the public and the specialists in an interdisciplinary manner. One of the first activities of the academy was an important collaboration with the American Scleral Lens Society. AILeS has an incredible reputation, and Laserfit’s Dr. Gemoules is thrilled to be presenting at their international congress in Rome on June 10th and 11th 2018. Alongside over 30+ renowned experts in the field, presentations will cover a range of areas including the impact of scleral lenses on the ocular surface, the life-changing effects of scleral lenses, and best practices in fitting scleral lenses, amongst other fascinating topics. Dr. Gemoule’s presentation will focus on best practices in fitting scleral lenses, with an emphasis on wavefront correction. Dr. G. looks forward to sharing his knowledge and his scleral advances with others in the industry!